A new year, a new decade, time for some new goals. As you plan your long distance races for the spring, consider joining us for your training runs. Check out th “About” link at the top of the right hand column of this blog for more details. Note that this season costs have gone up just a bit. For the shorter distance runners it’s still $1/week, but for the longer distance runners its $2 per week. This should help cover the cost of all the Gatorade, water, and snacks we have along the road. And as always, if you think you use more or less of the supplies than others feel free to adjust your contributions accordingly. Volunteering during the training session is crucial for the success of the program. A place to refuel, both physically and mentally, these little havens along the route don’t happen without the help of participants in the run. It means you have to wake up a little earlier in morning, have to catch a ride back to your car, and maybe meet up with me the day before… but is that a lot to ask once or twice over the next 15 weeks? Remember volunteering doesn’t mean you’ll miss the run that week, you can still support a stop and run the whole route. So please watch the blog each week (normally a roll call post will be sent out on a Thursday) and rush in to help when help is needed. Thanks in advance to all that contribute to make this work. This is not just for marathoners. Although most of the talk that goes on focuses on the marathons, these runs are for anyone running long. Routes can be altered to fit your needs. You can even jump in along the way if you like. The more the merrier. You can even jump in along the way. If you looked at the plan, this is week 0 of the plan. Why week 0? That’s because as Boston moves year to year my program tries to figure out when Boston actually is. I put an extra week in here just in case Boston comes early and we run out of time. Sort of a spare Week 1. There will be other things to learn along the way. Bring your own map. Carry it in a baggy so it doesn’t get wet. If you get lost you’re on your own, I’ve learned I can’t find you once you’re off the route. Watch for changes in the route when it snows, Breakheart doesn’t get plowed. Be careful in the snow. So this is where I ask what your plans are for this winter/spring. 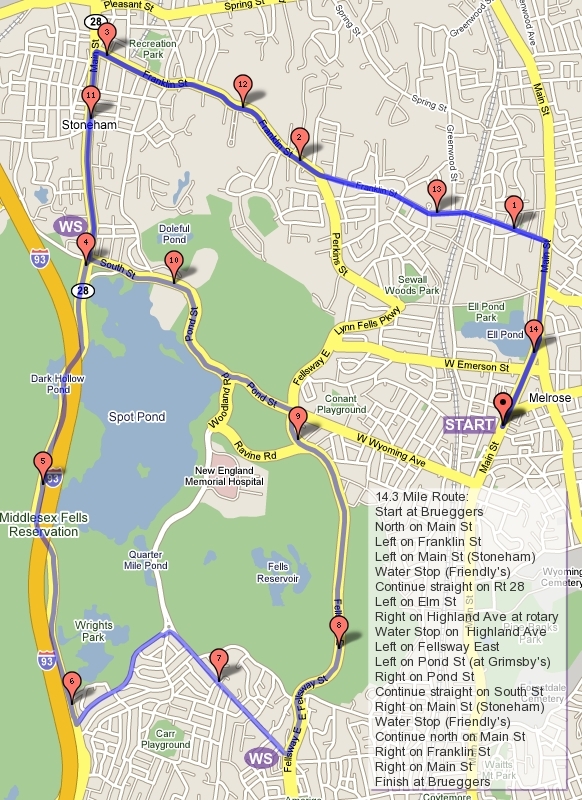 Although the plan is geared towards Boston, not all of us will be running that race. Let us know what marathon, half marathon, any race 10 or more miles really, that you’re training for. This will help me understand the needs of the runners, where water stops need extra food for extra miles, and any other factors that need consideration. Also it gives people who haven’t made their plans some food for thought. So offer up your plans, at the moment I’m planning on possibly the Martha’s Vineyard 20 Miler, and if that goes good maybe a surprise marathon in the spring. Post any other questions you have and I’ll try to answer them. Happy New Year, and see you Sunday, 8AM Brueggers!